Smoothies are by far one of my favourite things to experiment with and to eat (drink?). I love that you can pack them full of so many nutrients, vitamins, adaptogens, fats, proteins, etc! But more often that not I find that people who are trying to lose weight or get healthy are drinking these calorically dense sugar filled drinks every day that have no actual benefits and calling them smoothies and then they’re left wondering why they aren’t seeing any results when they think that they are “eating healthy”. The secret to a good smoothie is less is more, you don’t need 5 adaptogens or supplements in them to turn them into a nutritious and filling meal! I try to keep my smoothies lower in fruit so I don’t get that huge insulin spike from the sugar, I never add dairy or added sweeteners, I always add a fat source and a protein source, I add some kind of vegetable and some kind of seed for fibre/digestion and usually one adaptogen and/or extra supplement. Lately I have been playing around with green smoothie recipes and not to toot my own horn but I think I’ve mastered it and I’m going to share it with you guys along with all of it’s benefits! 1 Cup of Unsweetened Cashew Milk – I always make sure I buy unsweetened nut milks, I try to consume as little added sugar as possible! 2-3 HUGE Handfuls of Organic Spinach (washed first duh) – I have tested lettuces, kale, chard, etc and I personally like spinach the best plus it is high in niacin and zinc, as well as protein, fiber, vitamins A, C, E and K, thiamin, vitamin B6, folate, calcium, iron, magnesium, phosphorus, potassium, copper, and manganese!!! (WOAH) – remember to switch up your greens every so often though to make sure you’re getting a well rounded assortment of vitamins and so your body does not adapt to eating the same thing every day! 1/8 Cup of Cooled Steamed Sweet Potato (optional) – this is not necessary, the smoothie will still be delicious without – that being said sweet potato is a good source of Vitamin A in the form of beta-carotene as well as other vitamins and nutrients, plus adding a complex carb into your smoothie will keep you full and energized for longer! 4-5 Ice Cubes – to make it thick and cold because we aren’t adding a ton of frozen fruit! 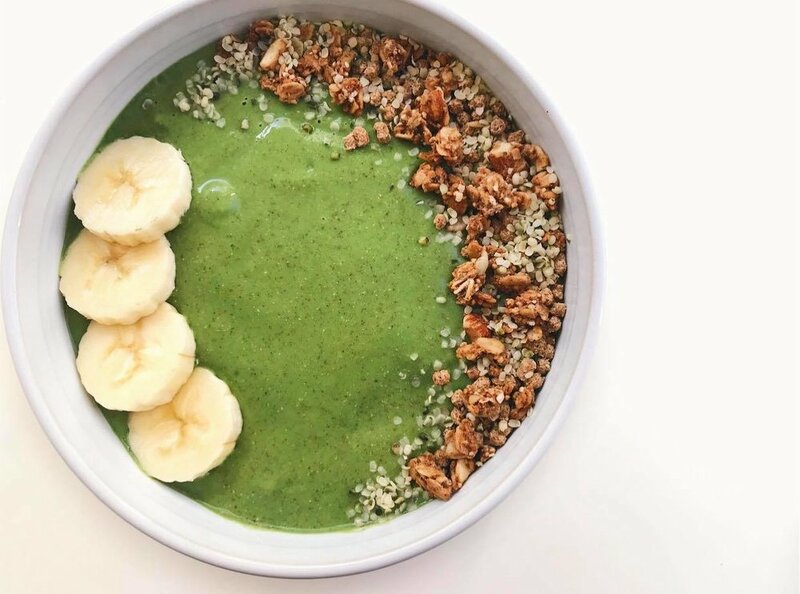 1/2 of a Frozen Banana – Bananas actually have one of the highest sugar content out of all fruit but I always use one small piece because; they are high in potassium and vitamin B6, they are easy to digest, they make the smoothie creamy and add the right amount of sweetness to hide all the greens! 1 Tbsp Chia Seeds – High in omega-3 fatty acids, which help to raise HDL cholesterol which is the “good” cholesterol that protects against heart attack and stroke, rich in antioxidants and they provide fiber, iron, and calcium! 1 Tbsp Ground Flax Seed - High in omega 3 fatty acids and fiber as well! Scoop of Plant Based Protein Powder – I use a plant based protein powder for a couple of reasons; 1. I have a dairy sensitivity 2. I like to keep my smoothies dairy free because dairy is actually very acidic and hard on our digestive systems, it throws our bodies PH levels out of whack and the point of this smoothie is optimal health! I make sure that my protein is all natural with no artificial sweeteners or colours and that it has at least 20grams of protein in a scoop! The one I’ve been really loving is this one! 1 Tsp Raw Organic Maca Powder – I add half of a suggested serving (which is 1 tsp) because it is powerful stuff! It is high in zinc, iodine, and essential fatty acids, it also helps to balance hormones and has been said to improve our mood! I’ve noticed a huge difference in my hormonal levels since I’ve started adding this into my daily routine. I do switch my green smoothies up as I said, I change out what greens I use as well as other ingredients. It isn’t healthy for us to eat the exact same thing every day even if it is vegetables and fruits, if we did then we would miss out on so many other vitamins – there is such thing as too much of a good thing. Some other things that I add in from time to time are; grass fed collagen peptides, flax oil, hemp hearts, avocado, natural peanut butter, raw ginger and steamed zucchini. If you make this smoothie or a variation make sure you tag me on instagram (@lulugodinfitness) I love to see you guys recreate my recipes!